The Leo Triplet of galaxies (aka Leo Trio) makes for extraordinary pictures due to the distinct differences between each of the galaxies. The galaxies are gravitationally bound to each other, and are commonly known as the M66 group. The lower right of the three galaxies is M65 - a spiral galaxy that seems to have suffered the least damage from the galaxies' encounter. To the left of M65 is the barred spiral galaxy, M66. This galaxy displays more consequence from the gravitational collision, as the galaxy's spiral arms are clearly deformed and the colorful arms are indicative of a high rate of star formation. The third galaxy of the Trio, NGC 3628, is an edge on unbarred spiral galaxy at the top in this image. NGC 3628 may be the most affected of the three galaxies, as this image shows its impressive tidal tail. Astronomers believe that the tidal tail is a result of the gravitational impact, and it consists primarily of young blue stars. The tail extends from the galaxy for over 300,000 light years. Due to its extreme faintness, the tidal tail is not commonly shown in photographs of NGC 3628. In addition to numerous background galaxies scattered throughout the image, the photo also shows the spiral galaxy NGC 3593 in the lower right corner. This galaxy is a member of the M66 group, and the M66 group is probably associated with the M96 group of galaxies. This image is a composite of three different sets of data. The main image is made from 25 hours of imaging with a 200mm lens at f/3.5. This portion of the image captured the tidal tail and the entire field of view of the image. Then, I blended in detailed images of M65 and M66 which were made from 7 1/2 hours of images captured through my C-8 telescope at 1160mm. Finally, the details in NGC 3628 were made by compositing an additional 16+ hours of C-8 data captured last year at 1260mm. As such, the aggregate time invested in capturing the data for this image is 49 hours! In this photo, North is Up. This image is cropped to 28% of the original full frame of the 200mm image. Software Used Images Plus 5.0 for camera control, calibration, stacking, digital development, star shrinking, smoothing and noise reduction, advanced Lucy-Richardson deconvolution, and multiresolution sharpening. Photoshop CS5 used for levels and curves, high pass filter, star shrinking, screen mask invert, lab color, saturation adjustments, selective color, vibrance, match color, and smart sharpen. Gradient Xterminator for gradient removal. Carboni Tools for additional noise reduction, and smoothing. Registar for aligning stacks and composites and for color channel alignment. Focus Magic for focus restoration. Notes This image represents the culmination of two years of imaging. I had first tried to capture NGC 3628's tidal tail last year with 16 hours of data using my C-8 at f/6.3. I was quite disappointed, as the tidal tail was barely visible after all of that imaging. By using the much faster 200mm lens (at f/3.5), I was finally able to capture this elusive target. Still, even after 25 hours of imaging, I had to stretch the data very aggressively to pull out the faint tidal tail. 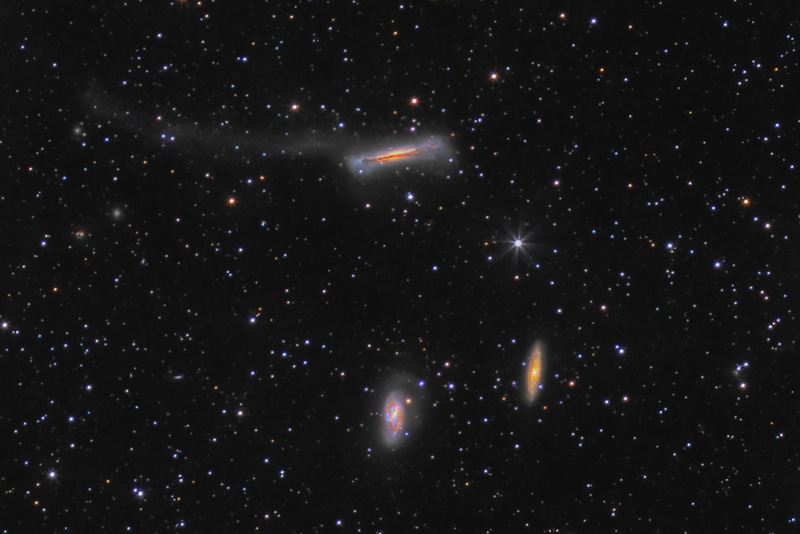 After I managed to coax the tidal tail into the image, I decided to composite in the detail images of the three galaxies from the C-8, as each of the galaxies sports such nice details. I'm extremely happy with this final image, as I believe it looks reasonably natural, yet shows nice details along with the uncommonly imaged tidal tail. This image was published in the Summer 2014 issue of Amateur Astronomy Magazine in my article entitled "Wide Field Astrophotography - Its Not Just For Beginners". This image won Cloudy Night's DSLR Image/Sketching contest for March 2013. It subsequently won the CloudyNight's March 2013 Imaging/Sketching contest (the finals between images from CCDs, DSLRs, etc.). This image was also published in the April 2017 issue of Sky and Telescope magazine in their article entitled "Herschel's Ghosts" (p. 34)!! !